After they were launched into space tonight, four Magnetospheric Multiscale (MMS) spacecraft are in Earth’s orbit preparing to study how the protective magnetic fields around the Earth sometimes disconnect and then reconnect. When this “magnetic reconnection” happens, the reconfiguration is explosive and releases as much energy as billions of megatons of TNT. These bursts of energy disrupt communications networks, GPS navigation, and electrical power grids. They also create the aurora, or Northern Lights. 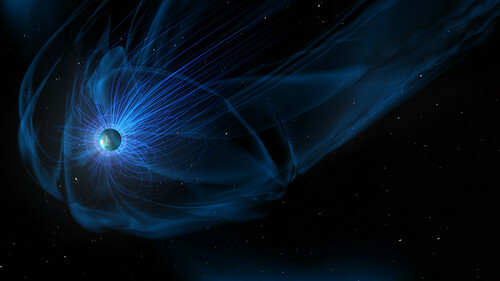 I find this NASA visualization of the Earth’s magnetic field incredible to consider. That we are shielded from cosmic destruction, inside this bubble of fluctuating energy. But that we are also part of this larger solar system environment – in which there is no longer an inner and outer, and where the planetary boundary is extended by energy, into space.